Music has been at the heart of human culture for millennia. It’s an integral part of many global communities, playing a key role in religious rituals, rite of passage ceremonies and social activities. For most people, though, it’s just about a banging beat and an anthemic chorus. Chuck on your headphones, and music can be a great way to take a break from everything. And regardless of your favourite artists and songs, the premise is the same for everyone. Of course, there’s nothing better than actually being able to experience music live. Gigs, concerts and festivals offer an amazing opportunity for you to be immersed in music. While the experience of a concert remains pretty much the same (loud speakers, warm beer, sweaty crowds and, inexplicably, great times despite all the above), there have been some big changes over the years thanks to technology. Not only has sound and production equipment improved, but you can now capture the experience with your smartphone and purchase tickets through the internet. However, as we embrace ever-more-connected change, expect to see things transform even further. Connected technologies have the ability to produce more immersive concert experiences, make gigs safer and clamp down on ticket touting. Here's how that'll be achieved. It’s always an amazing feeling to get to see your favourite artist perform, but when there are thousands of others in the same venue, things can get hectic. Security at major stadiums, arenas and concert halls is always beefed up, especially as paranoia around terrorism grows, though there are still many everyday challenges around health and safety. Popular gigs can attract tens of thousands of fans, and sometimes it’s impossible to look out for accidents or suspicious behaviour. The Internet of Things, however, could change this. Researchers at Kingston University in London are taking part in a £15 million Europe-wide project to explore ways that drones, wristbands and body-mounted cameras can transform security processes at gigs. Called Monica, the project came about when researchers in Copenhagen wanted to find a way to make rock concerts at the city’s Tivoli Gardens venue quieter and safer. 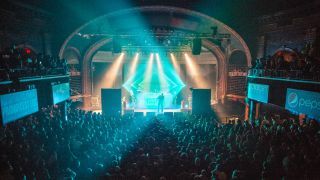 The Kingston University team has been focusing on security processes, and so far they’ve been investigating how smart devices can be integrated into an effective system for security professionals at concerts. Associate professor Vasileios Argyriou, who is working on the project with Professor Remagnino at Kingston University, tells TechRadar that there’s huge potential for concert organisers to transform security processes with the latest connected technology. Smart technologies could, for example, allow for two-way interaction between an artist and audience. “The research being undertaken by Kingston University’s Robot Vision team as part of the MONICA project will focus on exploring how the latest Internet of Things (IoT) technologies – such as smart wristbands, body-mounted cameras and drones – could be brought together and used to improve video surveillance and speed up the response from security teams to incidents in the middle of a large crowd,” he says. He adds that this technology can also help reduce noise pollution and create more personalised experiences for gig goers. “Some of the other project partners will be focusing on finding solutions to mitigate the impact of noise levels on residents during outdoor shows in major cities. Beyond this project though, there is the potential for such technologies to be used to help make people feel more connected and involved in an unfolding event as a community,” he says. The connected concert looks set to become mainstream, as opposed to an expensive gimmick. Circle Agency is one of the companies working to make this a reality. Recently, it teamed up with a social media tool that lets users create visually rich content for a gig. This is collated into one feed so that everyone can share each other’s experiences. Neil Hooper, board creative director at the agency, believes that technology can transform concert experiences in a positive way. “It’s clear that technology is transforming concert experiences for the better, offering consumers more ways to get involved with events on a deeper level. We were recently presented with an amazing social media application tool which works to enhance the festival experience,” he says. Technology is transforming concert experiences for the better, offering consumers more ways to get involved with events on a deeper level. Of course, there’s nothing more annoying than being in a massive crowd while the person in front of you blocks your view because they’re filming the gig on a smartphone. Hooper explains that technology can fix this challenge. “How does technology help to combat this? By enhancing the exclusive benefits offered to gig-goers,” he says. Virtual reality is another technology that could have a seismic impact on the concerts and other entertainment events of the future. Hooper explains that VR is an excellent way to allow people who can’t attend in person to get a taste of gigs. “When it comes to VR gigs, this is something we’re seeing more and more. This comes down to getting people off the sofa and experiencing the moment by watching events live,” he says. “For those who can’t experience an event in-person, VR is another great way of putting people at the heart of amazing experiences. However, VR gigs are insular so to try and create a shared experience we expect to see a rise in group VR booths which enable people to experience a concert or festival with their friends. As well as giving people a new way to immerse themselves in concerts, virtual reality can also be used in marketing processes. Jason Alan Snyder, chief technology officer at total brand experience agency Momentum Worldwide, sees a lot of potential here. “At Momentum our current arsenal of data science and insight tools allow us to get very close to the real needs and wants of fans at festivals like Panorama and Coachella,” he says. Another aspect of gigs that’s transformed hugely over the years is how consumers actually purchase tickets. If you want to see an artist, you can purchase a ticket online and have it shipped to your address a few days before the concert takes place. While this is convenient, it’s also seen the rise of ticket touts. These are people who purchase tickets to resell them for profit. A ticketing system [...] using biometrics and digital identities would make it impossible for bots to succeed. This isn’t new by any means, but the rise of online booking allows dodgy companies to use bots to purchase thousands of tickets at once - resulting in people being ripped off in after market sales. Artists such as Adele and Ed Sheeran have been clamping down on this, and touts can now be issued with unlimited fines. However, many believe that tech can go further. Robin Tombs, CEO of cyber security start-up Yoti, is one of those people. He says that artists and concert organisers should look at setting up ticketing systems that use biometrics to stop touts. “Bots have become incredibly common. Anyone can now get themselves a ticket buying bot for a few hundred pounds online,” he says. “But there is a solution. A ticketing system that checked the uniqueness of the individual by using biometrics and digital identities would make it impossible for bots to succeed.